With increasing traffic on the roads and rising fuel costs, swapping your mode of transport to a zippy, fuel-efficient motorcycle may start sounding more and more attractive. However, whether it’s the thrill of the ride or the joys of swooshing through bumper-to-bumper traffic, safety is always a necessity. No matter how far or how often you ride, there is always a risk of unfortunate encounters with other road users. Check your motorcycle regularly. The condition of your motorcycle is very important when it comes to your safety. As you would with your car, check (as often as possible) that it is in good riding condition. Check your lights, brakes, tyres and shocks. While you’re at it, get into the habit of riding with your main beams on, especially in low visibility conditions. Also other road users are sure to hear you coming, there is no harm in added visibility. Don’t compromise on your riding gear – your safety depends on it! Wear the right fitting shoes when riding, preferably ankle-high boots, as open shoes may pop off in the event of an impact. Whatever clothing you wear, ensure that you have knee, hip, elbow and shoulder padding with back protections. In the winter time, add a scarf to protect your neck. Don’t forget over-the-wrist full finger gloves to protect your hands. Last but certainly not least, a full-face helmet. Cover as much skin as you can to protect yourself from possible injury. Consider your speed. As tempting as it may seem to zip through traffic without the bumper-to-bumper stop-and-go, do consider the other road users. Speed limits are there for the protection of the road user; ride at a speed that is safe enough to allow reaction time should you need to come to a sudden halt. Increase your following distance. This may sound unrealistic, as you can manoeuvre your way past the bigger vehicles, however, keeping a safe distance will allow you to anticipate any sudden changes in traffic movement and allow you the time to respond accordingly to ensure your safety. Don’t be shy with your rear brake. When slowing down, remember to pump your rear brake to warn oncoming traffic behind you that you are about to slow down. Don’t be a stunt manYou may be tempted from time to time to show off the power of your motorcycle by performing attractive stunts or revs on the road, but don’t do it! This is not only for your safety, but for the safety of other road users. The open road is not a controlled environment – even for the trained professional, anything could go wrong. Ride within your comfort zone and don’t take on more than you can handle when it comes to the motorcycle you’re riding. Don’t drink and ride. If you find yourself in a situation where things got a little out of hand on a night out in the town, rather consider alternative transport to get yourself home safely than to risk riding under the influence and increasing the risk of an accident. Don’t ride fatigued. You may think you’ll make it, but it’s not worth the risk. Don’t ride tired, rather take some time to rest and revive a bit before swinging your leg over the saddle. If you can, arrange alternative transport here too. Know your forecast. Keeping tabs on the weather forecast may sound like admin, however, it’s beneficial admin. Knowing what to expect with regards to the weather will help you gear up correctly for the ride and plan your trip to minimise risks. Keeping these tips in mind when riding could be the difference between a grim ride and a safe ride to your destination. Arrive Alive shares more motorcycle safety and the young rider. 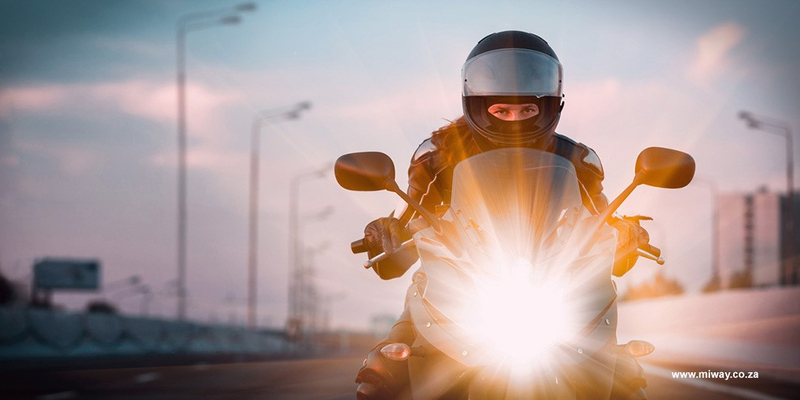 Road safety is a necessity with all the dangers lurking on the roads; why not take it a step further by insuring your motorcycle with an insurer that understands bikers’ insurance needs from personal experience? Insure your ride today!